P.O. Box 1052, Pembroke, MA 02359 On Your 617 . 833 . 7624 Engagement! 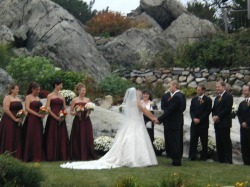 To personalize the perfect wedding ceremony for you. Did you say "yes" and get (or give) something "sparkly"? So exciting! Let's talk about your engagement and wedding! Enjoy browsing this site! Please call JP Sue at 617 . 833 . 7624, click on the Get in Touch page, or send email to JustPeace1@msn.com for more information. "My dearest friend, if you don't mind, I'd like to join you by your side. Where we could gaze into the stars and sit together, now and forever. For it is plain as anyone could see, we're simply meant to be." © Copyright 2010-2019 by Susan Z. Stamos. All rights reserved.